Our mission is to create community by providing a place of learning, sharing and experiencing sustainable living practices through Environmental Education, Sustainable Living Skills and Wellbeing Workshops facilitated by experienced and trained presenters. Live a more environmentally kind and sustainable life with knowledge and skills learnt in these presentations and workshops. Sustainable living is cost effective, healthy and rewarding, so why not join in? 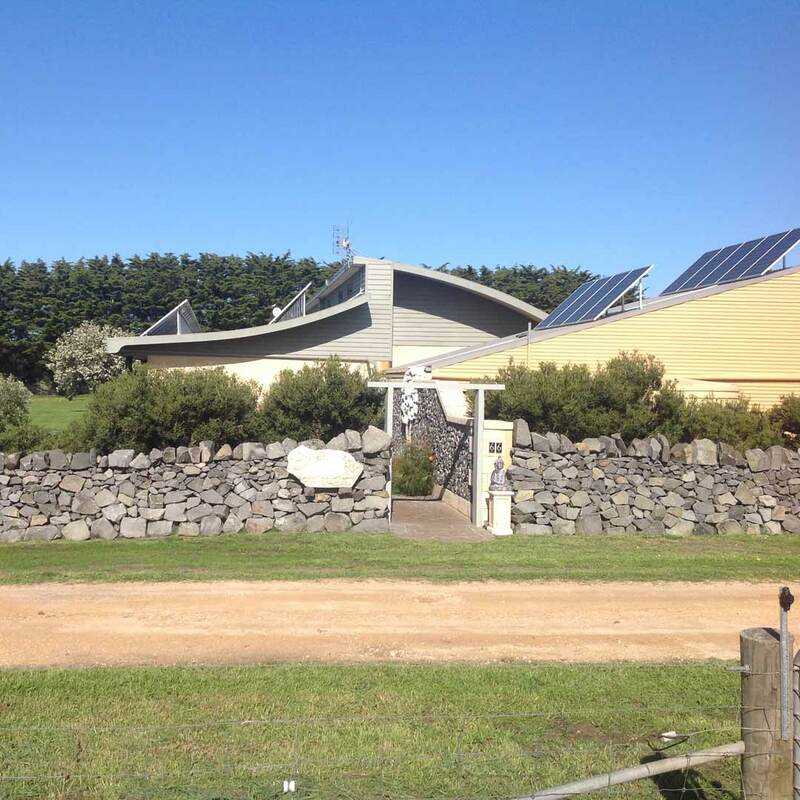 Nature’s Way Eco Sanctuary is situated on 6 organic acres in Rosebrook near the coastal town of Port Fairy in South West Victoria and boasts a magnificent straw bale, eco-friendly, fully self-sustaining house and gardens. This inspirational house of straw took the owner/builders 5 years and 746 bales to complete. The house and property is off-grid and powered by 12KW of solar panels. The electrical power is supplied by a Photovoltaic energy system which consists of 52 PV panels feeding 3 x 4KW inverters, which then supplies the house, the heat pump for the generation of hot water for the hydronic floor heating system and to charge a “Holden Volt” electric car. There is a 48 volt 900 amp hour battery bank for providing power at night. Eco-friendly products and materials have been used throughout the house including plant based paints & finishes that have been sourced locally. Energy consumption is minimised by living in a well-insulated straw bale house oriented to True North with no windows on the western end and small windows to the east to create the desired ambience. Each room has cross-ventilation for passive cooling if required in the summer and winter heating is achieved by circulating hot water through the hydronic coils in the floor. Water is harvested from a large roof area and stored in 2 x 22,000 litre tanks and supplies the house via a pressure pump system. There is no town water supply. Hot water for domestic use is generated by a roof mounted evacuated tube solar hot water system. The house has all the normal modern conveniences such as vertical fridge/freezer, dishwasher, washing machines, 65” TV and computers for a very comfortable lifestyle. Cooking is achieved with a gas range which consumes 2 x 45Kg gas bottles per year. Nature’s Way Eco Sanctuary is home to Merlin and friends, the Alpacas, who are the guardians for the Boar goats. The girls supply us with plenty of eggs. The Bees are busy producing honey & pollinating our organic orchard & chemical free gardens. Our Self-sufficient practices include: raised bed vegetable gardens, a fruit tree orchard, which is irrigated by the AA Worm Farm, free range chickens (which are housed in the fox proof mobile “chicken caravan”) and the rotational grazing of a small herd of boar goats for chemical-free meat production and honey bees for pollination and supply of honey. The purpose of NWES is to demonstrate a more sustainable way of living by minimising the consumption of yesterday’s sunshine and yet still enjoy a comfortable lifestyle. We employ natural and organic principles in our own daily lives and provide opportunities for people to learn skills and gain confidence to make positive changes that will enhance their lifestyle.